Fifteen years after the Berlin Wall came crashing down, the BBC's Ray Furlong finds heated debate is now raging in the German capital over what to do with the city's unique wall heritage. On 9 November 1989, thousands of East Germans began streaming west as parts of the massive concrete barrier were first torn down - a moment that marked the end of the Cold War. In the following weeks and months, the wall was almost completely pulled down and few tears were shed for the graffiti-stained, reinforced slabs of concrete that formerly divided a city and split a nation in two. 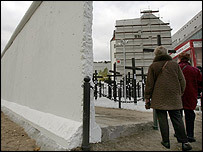 Fifteen years on, there's a campaign to get the remains put on the UNESCO world heritage list - while at Checkpoint Charlie, a businesswoman has actually rebuilt part of the wall as a tourist attraction. 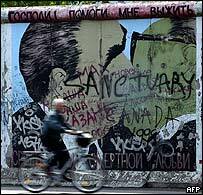 That new wall has stirred emotions over how best to commemorate Berlin's Cold War history. At Checkpoint Charlie, Berlin's former border crossing, 120 m of original wall segments form various locations have been re-assembled and whitewashed. More than a thousand large wooden crosses have also been erected, bearing the names of people killed trying to cross the wall. The rebuilt wall is the brainchild of Alexandra Hildebrandt, who owns the private Berlin Wall museum across the street from Checkpoint Charlie. "Berlin up until now has had no monument for the victims of the wall, for the German division, no monument for the second German dictatorship," she says. Certainly, deciding what to do with the Berlin Wall used to be so much easier. Leo Schmidt, a professor at Cottbus University and an expert in monuments, has been campaigning to make what is left of the wall a protected Unesco site. He has filled hundreds of pages documenting the forgotten remains - everything from rusty gates and crumbling foundation-work to lamp posts that lit the former 'death-strip'. "I became aware of the immense importance of the wall as probably the most historic building or monument of the 20th Century. Certainly the most potent symbol of the Cold War, it ought to be on the world heritage list," Professor Schmidt argues. "Much of it is gone but the question is, what do you do today with the remnants, hundreds of remnants? "And the sad thing is that they keep disappearing and there's a task and a challenge to keep more of that than is currently happening, because at present there's a vacuum in Berlin. Nobody in authority seems to be willing to deal with this problem." One of the Wall's most famous sites in Berlin is a section called the East Side Gallery, painted on by artists after 1990 and preserved as a tourist attraction and monument. This section is crumbling, affected by damp from a nearby river which causes rust on the iron bands inside it that in turn causes the concrete to crack. "The East Side Gallery is the longest and last stretch on its historical place, and we have to save this first of all," says one of the artists, Guenter Schaeffer. "To rebuild something, it's got a bad smell - the smell of business only." When pressed to explain what he means, Mr Schaeffer takes aim at the Berlin Wall museum. "To make only money with world history," the artist says. "The organisers of it are destroying the real truth with these new activities." Back at Checkpoint Charlie, a tour-guide explains the history to tourists. Afterwards, they can buy old Soviet-army hats from nearby stalls, and have their photo taken with a drama student dressed in a 1950s US army uniform. The new wall is just the latest addition to what some call a 'Wall Disneyland' - and a quick survey shows that Berliners are divided over it. "It's better to remember the facts and not to make it such a monumental thing for tourists," one woman says. "It's even nice for the Berlin inhabitants. For me, my kid is now 10 and he's learning that in school and he really can't imagine how it was," a man explains. "I think it's very good that they're rebuilding part of the wall because people don't know any more where the wall in Berlin has been," another woman told the BBC. For many, the trouble is that the new wall is in the wrong place, by several metres. To be historically authentic, it would have to be in the middle of road and that would block traffic. In any case, the new wall will be torn down again at the end of the year but the arguments over how Berlin should preserve historic wall sites are unlikely to disappear with it.